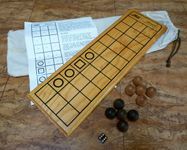 From the game instructions: While many gaming boards and illustrations of Senet survive today, the method of play is still a matter of speculation. We have taken what we believe to be the best suggestions for play made by archeologists and Egyptologists and combined them with our own variations to create JAM! JAM! is a board game for two players. Each player, alternating turns, attempts to move five counters from the starting row into the exit row. With all five counters resting on squares in the exit row, the player then begins to bear them off the board, one at a time, by landing them exactly on the exit square. The first player to bear off all five counters is the winner.